The Asiatic lion was listed as endangered in 2008 – an improvement on a critically endangered listing in 2000 – after numbers increased in the state’s Gir forest. What happened to the lions? It remains unclear but officials mainly suspect that a group of lions from a different area killed them in a battle over territory. They are fairly certain that this is what happened to at least eight of the 11, including three cubs. Forest official GK Sinha told reporters at least three adult male lions from another area entered a range in the forest and killed the cubs, in what he described as “infighting”. “This is a natural course of action among lions,” he said. What killed the remaining three lions is unknown. Wildlife conservationist Rajan Joshi told BBC Gujarati that he suspected Canine distemper virus (CDV) – carried by domestic dogs – may have played a role in the deaths. But officials said medical tests during the post mortem of the dead cats had not found any evidence of the virus. The virus was first described at the beginning of the 20th Century and has been cited as contributing to the demise of the thylacine (commonly known as the Tasmanian tiger due to the black stripes on its back). Lions are the only truly social cats, with related females living together in prides overseen by male coalitions that compete for possession in fierce and often fatal battles. They move quickly at night to look for prey and shelter. Both prey – mainly deer and abandoned cattle in Gujarat – and shelter – jungles, farms and orchards – are widely dispersed in unprotected areas outside the sanctuaries. How many lions are found in Gujarat? 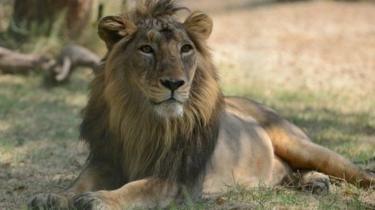 Gujarat is the world’s last abode of Asiatic lions, who once prowled a vast region between India and the Middle East. There are 523 lions living in a 22,000 sq km area, including the Gir sanctuary, in eight districts, according to the last census done in 2015. At least 200 of these lions are living in unprotected areas outside sanctuaries. The heavily protected Gir sanctuary, say experts, has a “carrying capacity” – an ecosystem’s ability to support a specific and often fixed number of species – of 300 lions. 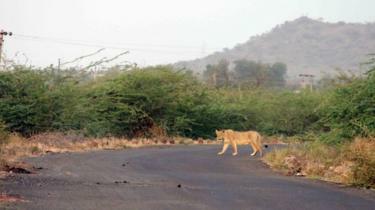 After the lion population exceeded the “capacity” in 1995, the big cats began moving out of Gir because of overcrowding. Lions are now routinely spotted on private farms and near village homes. A pride of 18 lions was captured in the region after three people were killed between April and May 2016. A bulk of the government’s budget for the big cat is spent on compensating farmers whose cattle have been killed by lions and on removing the big cats from farms. 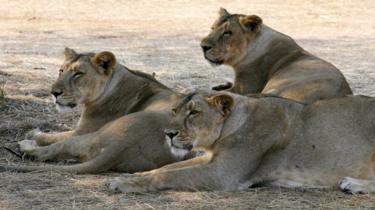 Wildlife officials say most of the lions outside the sanctuary live in Amreli and Bhavnagar districts. In June, the government announced that 109 sq km of area in these two districts would be reserved as a new sanctuary for lions. India’s Supreme Court had ruled in 2013 that Gujarat needed to relocate some of its lions to neighbouring Madhya Pradesh state to avoid the possibility of disease or some other disaster wiping out the entire population. However, the move has been delayed as studies on prey base, vegetation cover and local weather of the new habitat in Madhya Pradesh have not yet been completed. How common are lion deaths? Some 60% of the lions die of natural causes – their average lifespan is between 15 and 16 years, but many become old and infirm after nine or 10 years. In 2016, Ram, one of India’s oldest and most popular lions in the wild, died from old age in Gir. Ram was thought to be 15 years old. According to local officials, 184 lions have died in and around Gir since 2016. Only 30 deaths were caused by unnatural causes. These would include accidentally coming in contact with electric fences around farms and being hit by speeding vehicles and trains while crossing highways and railway tracks. Lions in the area have also drowned after falling in open village wells, and after drinking contaminated water.